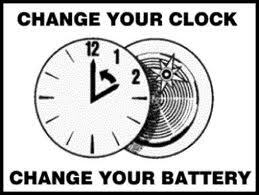 Daylight savings, time to change your smoke alarm batteries! It’s that time of year again folks when we change our clocks for daylight saving and remind you all that it’s time to replace the batteries in your smoke alarms with new batteries. For those of you who forget to do it over the weekend here is your friendly reminder to pop into the shops on your way home tonight and pick up some fresh replacements. We’ve been wondering what our friends in Western Australia, Queensland and the Northern Territory do to remind themselves it’s time to change their batteries. Feel free to leave us a comment and let us know!